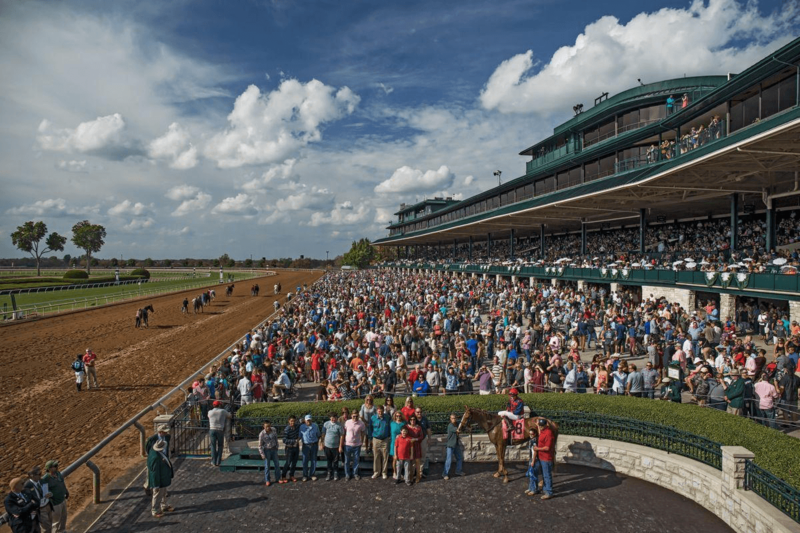 An eye-popping field of Kentucky Derby hopefuls are contesting the $1 million Blue Grass Stakes Saturday at Kentucky’s historic Keeneland Racecourse in Lexington. And, it’s just one of a trifecta of Derby preps, the best group seen yet on the road to glory in Louisville, the first Saturday in May — this year May 4. Like the Wood Memorial at Aqueduct and the Santa Anita Derby at Santa Anita, the Blue Grass is a 1 1/8 mile test for three-year-olds seeking forward momentum towards the 1 1/4 mile Kentucky Derby. That, while pocketing the 100-40-20-10 Derby points for first through fourth place. Only 20 make the Kentucky Derby starting gate and the points system decides who has priority to run for glory. It takes more than luck to win a race like Aqueduct’s $750,000 Wood Memorial. Here, the morning linemaker believes one of three evenly matched foes will emerge victorious in the field of 11. Tacitus at 5/2, is the race favorite for trainer Bill Mott. Last seen March 2 rallying through the length of the stretch, the upset winner of the Tampa Bay Derby at Tampa Bay Downs. That performance producing a stakes-record time of 1:41.90 for the 1 1/16 mile that was just 0.15 seconds off of Stanford’s overall track record set in 2017. A win here might move the grey speedster into the number one stall at Mott’s barn, taking the place of Hidden Scroll as Mott’s leading Derby contender. Hidden Scroll registered an indifferent performance in last Saturday’s Florida Derby. Haikal, 7/2, comes off his sterling win in the 1 mile Gotham Stakes, a one-turn event March 9, also at Aqueduct. He’s shown an ability to close into a hot pace. He’s dangerous if the race sets up for him as it did in the Gotham. His rail-skimming trip and stout closing kick put the Kiaran McLAughlin trainee into the Gotham winner’s circle. It remains to be seen he’s just lucky or that good. Tax rounds out the three top contenders here at 9/2 morning line odds. He’s lightly raced with only two starts — a third on Dec. 1 and a winning effort in the Withers Stakes in February. Both races were at Aqueduct his home track. The 1 1/8 mile Withers proves he can handle a distance of ground and he’s got the heart to recover from a stumble, attend the pace and squeeze through at the rail to win. For a complete list of Wood Memorial entrants, riders, trainers and the morning line, click here. Expected post time is 6:00 pm ET. Vekoma: He’s a speedy Florida transplant for trainer George Weaver, a tepid 9/5 morning line favorite. The Candy Ride colt took a pass on the Florida Derby for this spot, after a lackluster third in the Fountain of Youth at Gulfstream Park. However, he may be finding the waters in Kentucky just as deep. Win Win Win: He’s one of many horses thought to have solid Kentucky Derby credentials early this year. Then, as with so many others, he faltered in a Derby prep he was supposed to win. Can the Mike Trombetta trainee, pegged at 7/2 on the morning line, rebound from his highly disappointing effort in the Tampa Bay Derby? Signalman: at 5/1 projected odds, he’s a 2018 hotshot who failed in his first 2019 Derby prep, a dismal seventh, also in the Fountain of Youth. They’ll be no excuses acceptable in this spot, unless he’s not the quality horse that many had thought. Somelikeithotbrown: He’s on the rail in the Blue Grass and is seen as a threat if he can reproduce his form at Turfway Park, a synthetic track in North Kentucky, to the natural terra firma at Keeneland. At 10/1 on the morning line, he just might be what long shot players are looking for. If you think he can transfer his outstanding turf and synthetic resume to dirt, the Mike Maker pupil could prove to be a gold mine of riches. That’s If the favorites are, indeed pretenders. We’ll find out Saturday. For a complete list of Blue Grass entrants, riders, trainers and the morning line, click here. The projected post time is 6:23 pm ET. The entire Thoroughbred racing universe will be watching as the two-year-old champ, Game Winner, tries to show he’s the real deal when it comes to the Kentucky Derby. He’ll be odds on to win the Santa Anita Derby Saturday, The future of racing in the near term and, perhaps, the long term at the historic track, near Los Angeles may depend on a safe day of competition. Track management says it will race this weekend despite recent calls for a suspension of activity while authorities investigate an abnormal number of fatal accidents — 23 in all — since it opened the day after Christmas. The race itself, despite only six horses, presents an interesting handicapping challenge. Game Winner: Generally regarded as Triple Crown winning trainer Bob Baffert’s top Derby horse, He was second last month in the Rebel Stakes at Oaklawn Park, losing by a whisker in a tight photo to Omaha Beach. He’ll be seen next week in the Arkansas Derby. The Rebel marks Game Winner’s first effort since winning the Breeders’ Cup Juvenile in November. Roadster: The likely second choice also is trained by Baffert. Although super impressive in a maiden race in late July he lost to stablemate Game Winner in the Del Mar Futurity in September. He then took a break for surgery to improve his breathing. Returning to the races at Santa Anita in March, he displayed his class in a workmanlike win over allowance company. He has no Derby points and will probably need to win or place to make the race. Instagrand: He’s another lightly raced horse from the barn of Jerry Hollendorfer, one of the best trainers on the west coast. He packed his tack for New York to finish a disappointing third in the Gotham Stakes. However the race marks only his third lifetime start. Instagrand also needs Derby points and he’ll have to show he can sustain his speed beyond a mile to get them. For a complete list of Santa Anita Derby entrants, riders, trainers and the morning line click here. The projected post time is 6:30 pm ET.